I made most of them in a similar way to Sara’s, but I did it more of a classic “stack & slash” method, so, cut, swap, sew, cut, swap, sew, etc. I made one pair using Sophie’s method, but I started with layered scraps, since I didn’t have another 10″ square of my white background fabric. Either way, they were really quite easy, so if I don’t win, I think I’ll definitely make up some more for myself. 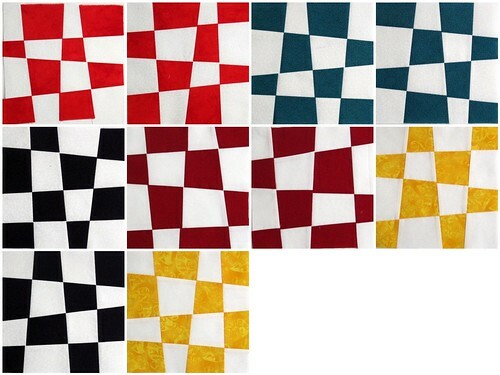 One of the things I LOVE about quilting is that there's rarely one right way to do anything. Your blocks look great! I've added them to the list. If you make blocks on your own for a quilt, please be sure to come back and share it with us.